Windsor First Aid (Windsor, Ontario) offers potential students quality training programs for CPR, all taught by St Mark James certified instructors. 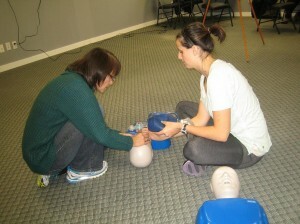 A large selection of CPR programs is available, with various focuses. There are three levels trainees have to choose from: A, C, and HCP. All of the levels teach trainees basic CPR for adult victims but only C and HCP also include CPR for pediatric victims. There is no other provider in Ontario that offers better rates than Windsor First Aid. Enrol today! Windsor First Aid offers potential students different ways to sign up for a training program. The quickest way to sign up is through the Windsor First Aid website. You can find a list of class rates and schedules on the site, along with an online registration form. You can send your enrolment request and details through the form. Expect replies during business hours. Other ways to enrol are e-mail, telephone call, and in-person enrolments. Again, any requests made through the methods mentioned will be replied to during business hours. All fees and tuition are settled before training before begins, ensuring that there will be no additional expenses while a student is training. The total fees paid during enrolment include tuition, taxes, certificates, registration, and St Mark James training manuals. Windsor First Aid offers the best deals. However, should you decide to drop out of training, just remember to inform the staff at least 72 hours beforehand so you receive full reimbursement. The CPR training program has three levels that a student needs to choose from, each level lasts 4, 5, and 6 hours long respectively. CPR A teaches students adult CPR and CPR C and HCP teaches students both adult and pediatric CPR. CPR HCP is targeted towards health care providers and health care workers. Full programs include basic first aid training as well. The CPR program teaches students the latest guidelines for Basic Life Support (BLS) from the American Heart Association. One of the focused topics is the change from A-B-C (airway, breathing, circulation) in the CPR algorythm to C-A-B. Starting with 30 chest compressions before rescue breaths has been shown to improve survival rates. Certificates are awarded to students after passing a program. The requirements to pass are: good chest compression and rescue breath skills, at least 75 percent on the written exam, and complete attendance. All students receive a St Mark James certificate card but wall-mount sized certificates are available upon request. Within three years, certificates have to be recertified through recertification classes. Recertification is held several times a week at least, varying in length from 4 hours to 8 hours. Only standard first aid, childcare first aid, CPR C and HCP have available recertification classes. There are different stages as a bedsore develops and worsens. Bedsores are wounds typically found on the tailbone area of a bed ridden person. The tissue around that area begins to die because circulation is impeded by constant, prolonged pressure and friction. Stage 1: The first stage of a bedsore starts out as no visible wounds. The skin is very red and doesn’t blanch (turn white for several seconds when touched). Skin can also be very pale or bluish. It is usually very warm compared to the rest of the skin.